An epidemic is spreading through the Fraser Experimental Forest west of Denver, Colorado. 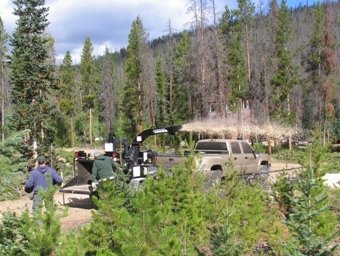 Pine beetles have long played an important role in the natural cycle of Rocky Mountain forests, but warming temperatures and drought conditions elevated the pest to epidemic proportions earlier this decade. The results have been devastating; estimates suggest up to 70 percent of pines within the forest's 23,000-acre expanse have been attacked by beetles, which starve the trees for water until they die. Researchers are stepping in with a Bandit Model 990XP 12-inch drum chipper, intent on turning the dry, potentially dangerous forest fire fuel into chips, all the while studying biomass potential and the economics involved in creating a value-added product from low-value wood. "You see all these acres of dead material, and this huge short-term supply— the question is, what can we do with it?" said Chuck Rhoades, U.S. Forest Service biogeochemist and researcher at the Fraser Experimental Forest. "One of the big things we're looking at is options for utilization of the smaller, low value material." Rhoades is collaborating with a handful of researchers both at the Fraser Experimental Forest and the Rocky Mountain Research Station in Fort Collins, examining potential uses for the dead and dying material. 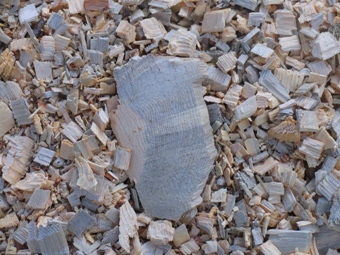 In keeping with the tradition of in-depth research conducted at the forest since 1937, the project won't simply be an off-the-cuff effort to utilize waste wood; the study will take a close look at the biomass potential of various types of chipped material in a wide range of environments. Specific focus will be given to the beetle-killed pine, not just because it's plentiful, but because the beetle infestation alters the physical appearance of the wood, staining it blue. Researchers like Rhoades are eager to learn if the material might also be altered chemically, possibly making beetle-killed pine a more—or less—effective chip for biomass applications. Rather than just chipping the wood and leaving it on the ground, however, the team at the Fraser Experimental Forest will turn the chips into a potentially soil-improving product called biochar. "Charcoal is a part of our natural ecosystems; almost all forests have charcoal in them," said Rhoades. "Biochar is basically the waste product that comes out of the end of this process when you burn things off in a low oxygen environment." The big thing with biochar is its use as a soil amendment ," said Dr. Daniel McCollum, an economist with the Forest Service and one of the project leaders. McCollum's primary role lies in determining the feasibility of harvesting and processing material versus the end value, though he's also quite familiar with biochar and its potential applications. "Prior research is showing that biochar has its greatest impact in infertile soils, which makes sense," said McCollum. "On highly fertile agricultural soils the impact has been minimal at best, but in other places, plant growth takes off; so it seems like there can be positive impacts under certain kinds of conditions." To create biochar, researchers will take chips produced by the 990XP and send them to Biochar Engineering Corporation (BEC) in Golden, Colorado. Pyrolysis units then "cook" the chips into biochar, which is returned to researchers at the forest. Beginning next spring, the biochar will be introduced to a variety of soils in varying conditions throughout the Experimental Forest, where its effects will be evaluated over the next few years. Another important aspect of this research relates to assessing to what extent biochar is a carbon negative product, as adding biochar to soil stores CO2 that would normally be released into the atmosphere through natural decomposition. Factoring in the harvesting and production of biochar to determine its overall carbon footprint is something the researchers at the Experimental Forest will be investigating, along with a comprehensive cost analysis that will reveal dollar for dollar the expenditures involved in harvesting, chipping, and producing biomass. "This will be a kind of cradle to grave analysis of the whole system," Rhoades explained. "If we're trying to come up with this additional product or value from it, we've got to consider all the costs of creating it." In that role, the Model 990XP will serve not only as a wood chipper, but as a fiscal benchmark for what it actually costs to chip wood. "We'll know every drop of fuel, every bit of hydraulic fluid, what it all takes daily to go into the machine to operate it," said Dan Bowker, researcher and primary chipper operator for the study. "What I'm doing, how many minutes am I spending a day actually feeding the machine, how many minutes does it take me to reverse stuff out of there and clean it up, if there's any shutdown time when I have to move the output like we had to do earlier, that kind of thing. We're just really figuring out how much time, money and fuel goes into getting a certain amount of product out, then connecting it with the value of that product after we've turned everything else." Bowker estimates that 90 to 100 yards of material have been run through the 990XP since it was delivered to the research team this past summer, with machine usage to date totaling just over 20 hours. It's still too early in the program for preliminary operating data, but with the 990 essentially operating under a microscope these past few months, feedback on the machine has thus far been positive. "I was quite surprised at how effective the chipper was at processing large diameter material of 12 to 14 inches," said Bowker. "Only once did we feed a log in that was just too big. In that case, we shut it down, cleaned it out, and fired it back up. No big problem." Bowker says the chip quality and size is "very consistent" save for occasional issues with large diameter, short length material turning sideways in the feed, which sometimes results in longer, splintered chips. "Of course, in a production setting, a nice investment would be a mechanized feed that could handle tree length material," he said. Despite this, Bowker has good words for the 990XP, the material it produces, and the local distributor they're working with. "It's easy to operate, easy to work on," he said. "The guys at BEC said our chips are their favorite feedstock to process so far. Support from Global Machinery in Denver has been great; I get prompt calls back every time I contact them". Rhoades sees their new Model 990XP as having a broad role in the weeks, months and years to come. "Right now we got [the 990XP] for a biochar project, but we will use it for a number of things," he said. "Some of them are just site maintenance, getting rid of some of the hazardous fuel lying around. But we also have other sorts of research projects that require us to use chips, other fuels-management activities." For over 70 years, the Fraser Experimental Forest has provided scientists and researchers with unique, long-term research and observation opportunities on everything from stream flow, water chemistry, sediment release, climate data, tree growth, and much more. Though the pine beetle epidemic has posed new problems for the forest, new research gleamed from the devastation may help the forest recover, all while providing valuable insight into the finer points of the burgeoning biomass market. "There's a lot of experimentation and methods development going on right now," Rhoades said. "We're going to be contributing to it by giving them wood from different tree species, at different moisture content, and material size. . . and we'll also be doing experiments with how that influences water quality, soil fertility, and the things on the exhaust side." "We've got piles of wood for years here," said Rhoades. "We're literally not going to run out anytime soon."